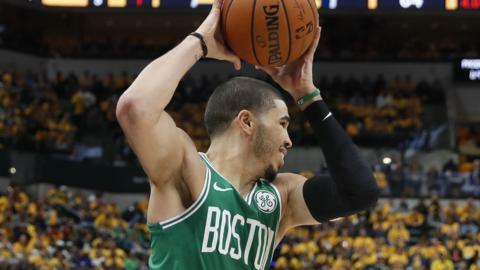 Boston Celtics beat Indian Pacers 110-106 to take a winning 4-0 lead in the series and become the first team to reach the NBA semi-finals. Sheffield Sharks captain Mike Tuck says his team needs to gain momentum as they aim for a good draw in the BBL Play-offs. Read more on Is there enough drug testing in English team sports? What has gone wrong for LeBron James and the Lakers? Read more on What has gone wrong for LeBron James and the Lakers? LeBron James gets emotional as he passes Michael Jordan's NBA points tally of 32,292 in a 31-point game for the LA Lakers.